In This Issue: December Christmas Party – Guest band: NOJCSC Jazz Ambassadors – “Cheer for Children” Toy Drive – 2014 Membership Drive – Youth Jazz Band – and more! 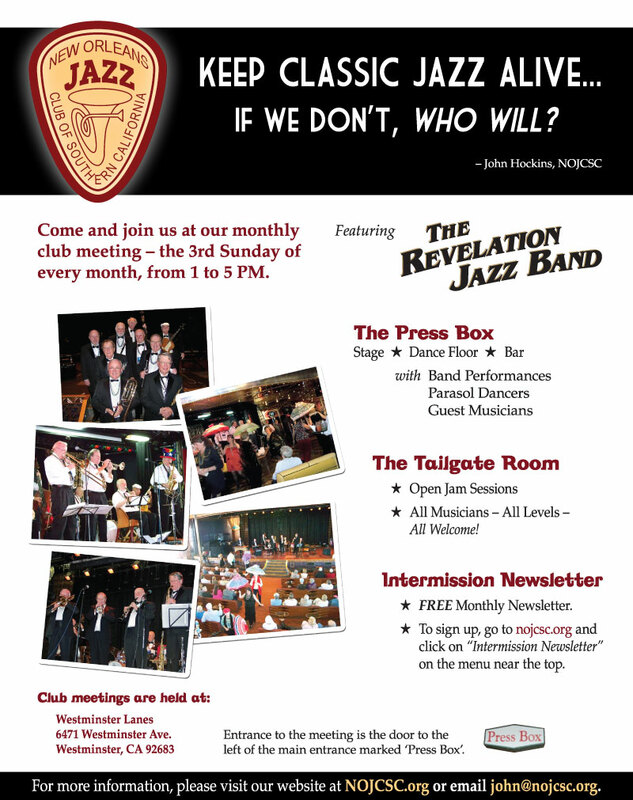 Please join us at our next Club meeting on Sunday, December 15, 2013 at the Press Box at Westminster Lanes, Westminster for an entertaining afternoon of Traditional Jazz and Swing featuring this month’s guest band, the NOJCSC Jazz Ambassadors, as well as the Revelation Jazz Band, Youth Band and Club Musicians performing all afternoon. Plus, you won’t want to miss our free Christmas Buffet! 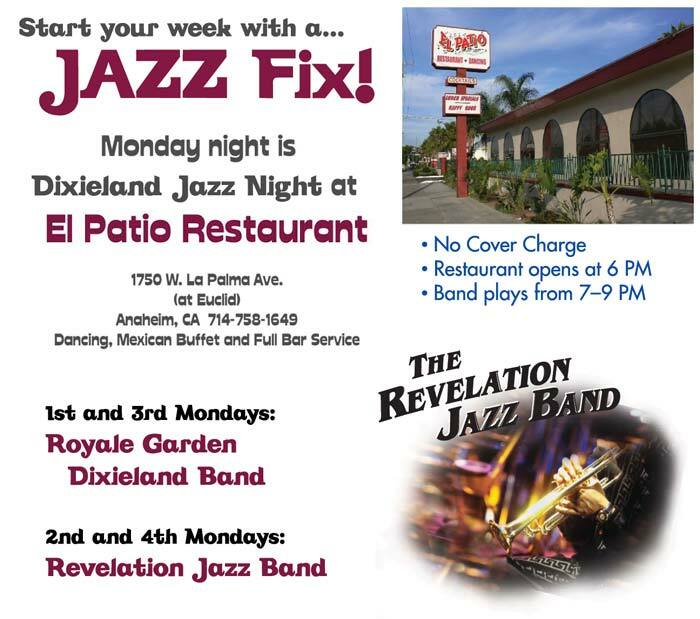 The NOJCSC “Jazz Ambassadors” are made up of experienced LA-area jazz musicians who are well versed in the Traditional Jazz style and repertoire. 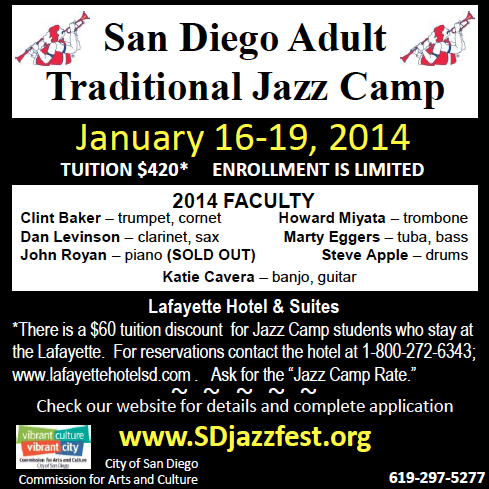 Their mission is to help to perpetuate this great American art form by spreading the joy of their music through concerts and clinics, and to inspire and encourage new musicians to become interested in learning and performing Traditional Jazz. The Jazz Ambassadors are a project of the NOJCSC. Their love and enthusiasm for the Traditional Jazz style, in addition to their exceptional musical skills, are key factors in helping to keep our music alive by presenting it in performances at area schools, colleges, and public events. The Ambassadors often give of their time and energy by performing for school concerts at minimal-to-no charge. Once again, we are supporting “Cheer for Children” (CFC) with our annual Toy Drive. Please being a new, unwrapped toy to the December club meeting on 12/15 for us to collect and deliver to CFC for distribution to underprivileged and hospitalized children in time for Christmas. “Cheer for Children” is a non-profit, all volunteer organization in the South Bay. Every year since, 1985, they have hosted seasonal events at Harbor UCLA Medical Center for acutely ill children and their families. CFC also has events at Washington and Jefferson Schools for the physically challenged children. When other organizations cannot respond to special and unusual circumstances, CFC always tries to fill this void. Their holiday program enables them to provide gifts, including toys, clothes and food, shoe certificates, and gas cards to entire families in need. Good seasonal wishes to you all! Our November meeting of the Youth Band included student musicians Afton Siegel, trumpet & drums; Nolan Delmer, trombone; Jared Crawford, tuba; and Brian Tyler, drums. A special thanks goes out to music educator and trumpeter Ryan Merrill, for all of his help in recruiting young musicians for the group! The Youth Band musicians performed “Canal Street Blues” and “South” during the first set on the Press Box main stage. Their performance was very well received by all!